10. 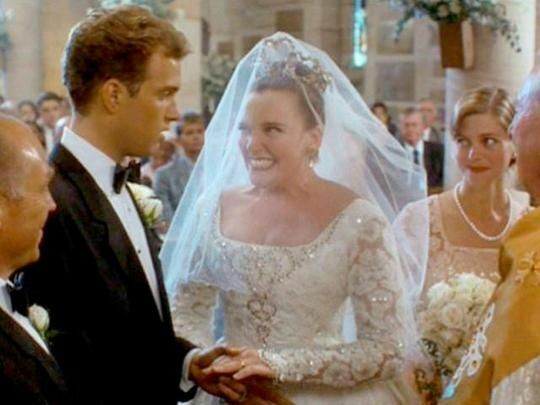 Muriel’s Wedding/Betsy’s Wedding – Yes, we have a tie and not because I’m too lazy to pick one, but because both wedding themed movies are equally good for different reasons. Muriel’s Wedding is a unique Australian film that introduced two of today’s finer actresses to American audiences. Toni Collette plays the socially inept Muriel, a girl willing to go to extremes to get married, and Rachel Griffiths, of Six Feet Under and Brothers and Sisters fame, plays her best friend. Muriel’s Wedding is a better movie than the other as far as the script and storyline, but Anthony LaPaglia’s hilarious Stevie D and Madeline Kahn’s wonderfully modest mother of the bride in Betsy’s wedding deserve a special mention and shouldn’t be missed. 8. Gone with the Wind – There’s no greater heroine than Katie Scarlett O’Hara. She may have been a spoiled young woman, but she also brilliantly maneuvered her way through the challenges of the Civil War. She was definitely the mentally strongest character in her family, and in the story. Sure, there are plenty of wonderful performances in the film, but all pale in comparison to Vivian Leigh’s Scarlett. Despite its four-hour length, I can get swept in this saga every time it’s on television, and have even traveled to the theater to see it on the big screen. This film swept the Oscars in 1939, winning Best Picture, Best Actor for Clark Gable, Best Actress for Leigh and Best Supporting Actress for Hattie McDaniel, to name a few. 7. 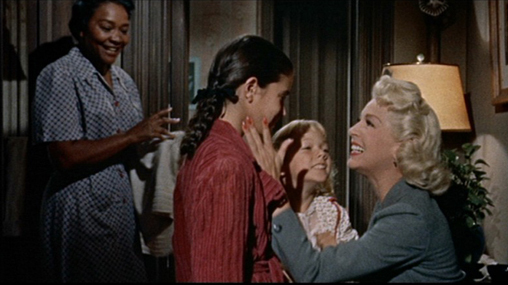 Imitation of Life – The earlier version with Claudette Colbert is good and closer to the original story, but the 1959 film with Lana Turner and Sandra Dee is so full of wonderful drama, it has to be crowned as the queen of all tear-jerkers. Based on a 1933 Fannie Hurst novel of the same name, the story seems almost modern as two single mothers, one black and one white, struggle to raise their daughters alone, until they find each other and combine efforts. The drama occurs when the black daughter, who often passes as white, decides to lie about her roots and completely deny where she came from, which breaks her mother’s heart. Good Hollywood stuff, and if you plan to watch, have plenty of tissues on hand. The film was nominated for two Oscars for Best Actress for Juanita Moore and Best Supporting Actress for Susan Kohner. 6. 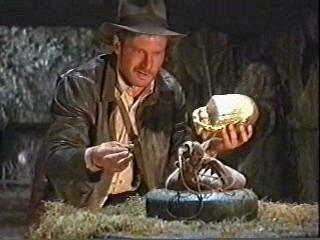 Raiders of the Lost Ark – Of all the action movies out there, this is one of the best. When my friends and I first saw this as a new release back in 1981, we loved it so much we stayed to watch it again at the next showing. 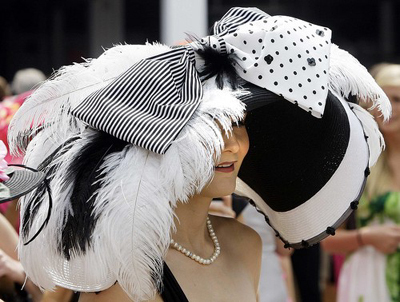 Of course, it was back in the day when you could get away with that sort of thing. I adore this movie for many reasons, but mostly because it’s not your typical “blood fest” action movie, but rather it entertains with a compelling storyline and great performances that captivate you from the beginning. In other words, it’s a thrilling movie that the whole family can enjoy. And watching the handsome Harrison Ford as the dashing and debonair Indiana Jones isn’t bad, either. The movie won four Oscars for Best Art Direction, Editing, Visual Effects and Sound. 5. When Harry Met Sally – A witty script, a fine cast and a timeless soundtrack all combine to make When Harry Met Sally the best romantic comedy of all time. Plus it asks the age-old question can men and women be just friends, or does sexual attraction always get in the way? 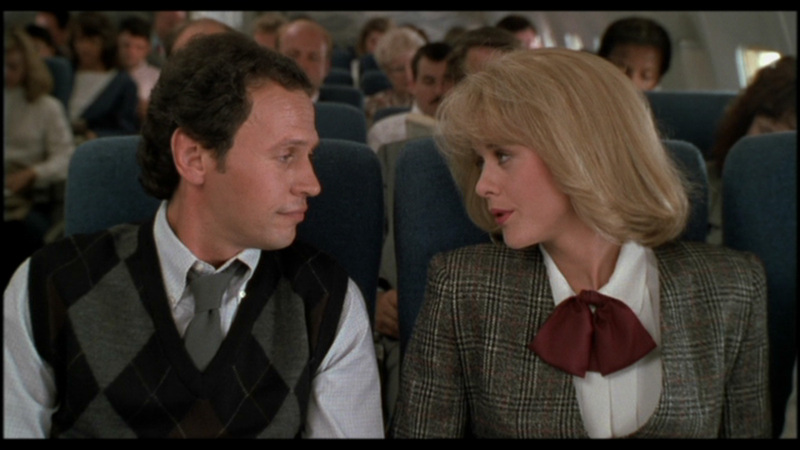 The movie features Meg Ryan at her absolute best and Billy Crystal, who’s always funny in each role he chooses. Kudos to the supporting cast, Carrie Fisher and Bruno Kirby, who play it well as their best friends who coax them along and try to show them they really do belong together. This film was nominated for Best Original Screenplay. 4. Ordinary People – Robert Redford’s masterpiece, Ordinary People, may be the movie that had the most impact on me at that point of my young life. I was still a teenager when I saw this heart wrenching drama of a family trying to cope with the death of one of their own, and a son desperately trying to forgive himself, and gain his mother’s love. In addition, the film featured Mary Tyler Moore as I had never seen her before, playing the cold, distant mother, who worried too much about what her society friends thought, and was incapable of showing her younger son that she cared. Timothy Hutton won an Oscar for Best Supporting Actor for this role, his first, and Redford won for Best Director. The film also won for Best Picture. 3. 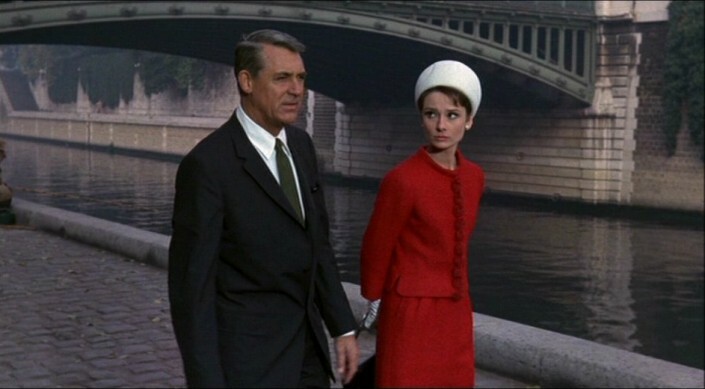 Charade – Audrey Hepburn and Cary Grant are a perfect combination in this fun Hitchcock like classic, despite their 25-year age difference. Supposedly Grant wanted it written in to the script, which is as thrilling as it is funny and charming, that Hepburn’s character is pursuing him rather than vice versa because he felt odd about the age difference. Charade earned an Oscar nomination for Best Original Song, and was remade albeit poorly as “The Truth About Charlie” with Mark Wahlberg and Thandie Newton. But don’t waste your time. See the original. 2. 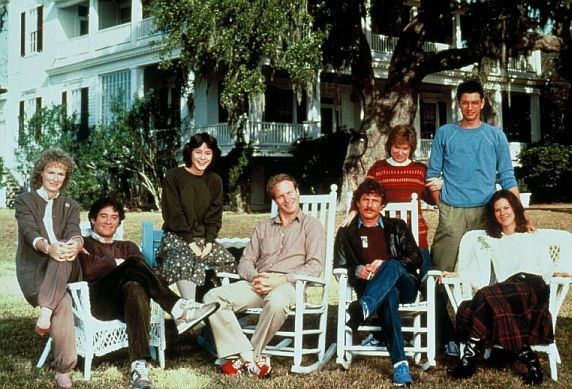 The Big Chill – What happens when old college friends get together for the funeral of one of their own? Great music and conversation and plenty of surprising twists and turns. I especially love the storyline between William Hurt, who plays a former radio psychologist, and Meg Tilly, the young girlfriend of the deceased friend. The rest of cast is also superb and features Kevin Kline, Glenn Close, Mary Kay Place, Jo Beth Williams, Tom Berenger and Jeff Goldblum. It also was the first film appearance by a young Kevin Costner, but his scenes ended up on the cutting room floor. The film earned Best Picture and Best Actress (Glenn Close) nominations. 1. Notorious – Alfred Hitchcock’s spine tingling Notorious is tops on the list. 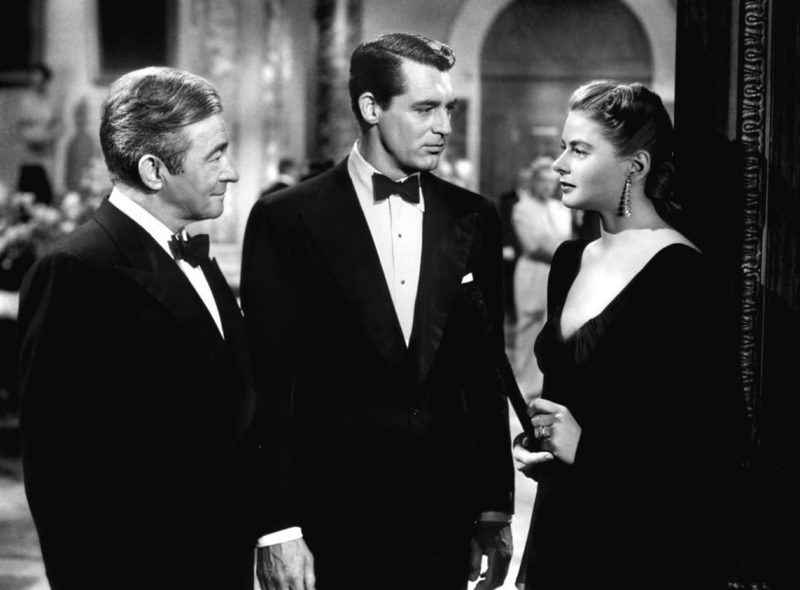 Cary Grant stars opposite a very creepy Claude Raines and Ingrid Bergman, the woman the FBI hires to get the goods on Nazis they believe are planning something in South America after WWII. Grant falls in love with Bergman’s character, the girl with the tainted past, and he is often as cruel and he is romantic with her. There are so many thrillingly tense scenes and fine performances in this movie, there is no better. Not only is it the most romantic movie of all time, with just enough ups and downs along the way that make for good drama, but it’s also has one of the cleverest scripts ever written. Grant is a fine actor, and Bergman is luminous. P.S. Special mention goes to the following, which made the initial list and had to be cut to narrow it ten, a painfully difficult task: Annie Hall, Amelie, The Big Lebowski, The Graduate, Groundhog Day, A Hard Day’s Night, Casablanca, Terms of Endearment, Thelma and Louise, and The Unbearable Lightness of Being, many of which were featured on TCM’s 31 Days of Oscar this month. May 3, 2013 – Today, I offer a medley of brief thoughts for the first Friday in May. “Gone with the Wind”, one of my favorite books and movies, received a well-deserved Pulitzer Prize for Fiction on this day back in 1937. Published in 1936, it was Mitchell’s only novel during her lifetime. Her earlier works were published after her death. “The Fantasticks”, the Off-Broadway sensation, opened in Greenwich Village on this day back in 1960. The musical, whose cast includes a character known as the “wall” that separates two houses, became the longest running musical of all time. I saw it years ago in New York at its original theater, and in Philadelphia a few years back at the wonderful Kimmel Center. Finally, as a blogger, it’s my duty to mention that today is World Press Freedom Day. The United Nations General Assembly declared that on each May 3 – and today is its 20th anniversary – we will raise awareness of the importance of freedom of the press, and pay tribute to journalists who have lost their lives in the line of duty. 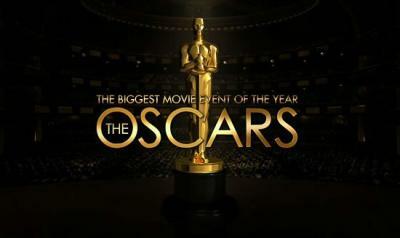 February 6, 2013 — February is the month to celebrate everything Oscar – The 85th Annual Academy Awards Ceremony will air on Sunday, February 24 – and today we’ll look closer at the Best Picture category. To date, there have been 503 films nominated for this top honor, including this year’s nominations, Amour, Argo, Beasts of the Southern Wild, Django Unchained, Les Miserables, Life of Pi, Lincoln, Silver Linings Playbook and Zero Dark Thirty. 1. It Happened One Night – 1934 – A spoiled heiress (Claudette Colbert) runs away from her family and meets a man who offers to help her (Clark Gable), who is actually a reporter looking for her story. 2. 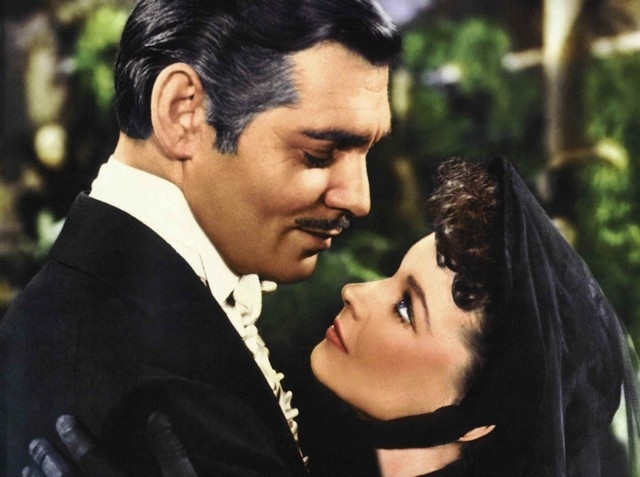 Gone with the Wind – 1939 – Fine Civil War and Reconstruction drama starring Clark Gable as an unscrupulous man in love with a scheming woman (Vivien Leigh) in the South. 3. Casablanca – 1943 – Set in unoccupied Africa (Morocco) during the early days of World War II, an American bar owner (Humphrey Bogart) meets a former lover (Ingrid Bergman) who deserted him in Paris the day the Germans took over. 4. From Here to Eternity – 1953 – In 1941 Hawaii, the lives of servicemen and their women (a large cast featuring Burt Lancaster, Deborah Kerr and Frank Sinatra) unfold right before Pearl Harbor is attacked. 5. West Side Story – 1961 – A Romeo and Juliet type musical about two youngsters from rival gangs who fall in love. 6. The Sound of Music – 1965 – A widower (Christopher Plumber) with seven children falls in love with a woman (Julie Andrews) who leaves a convent to become their governess. 7. Annie Hall – 1977 – A neurotic New York comedian (Woody Allen) falls for a ditsy Annie Hall (Diane Keaton) in this movie that created an instant fashion trend. 8. 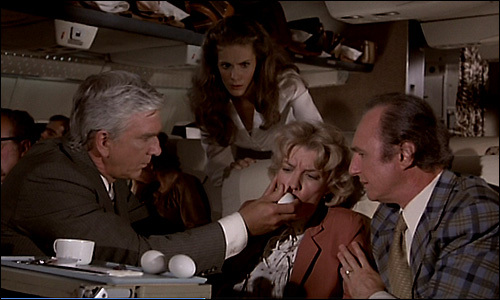 Ordinary People – 1980 – The accidental drowning of the older son deeply strains the relationships among the bitter mother (Mary Tyler Moore), the good-natured father (Donald Sutherland), and the troubled younger son (Timothy Hutton). 9. Terms of Endearment – 1983 – A movie about a controlling mother (Shirley McLain) and a free spirited daughter (Debra Winger), and their trials and tribulations through their lives. 10. Dances with Wolves – 1990 – Lt. John Dunbar (Kevin Costner) is a Civil War soldier exiled to a remote western where he befriends wolves and Indians. February 1, 2013 – Today we begin February, a month notoriously cold in these parts, but also one that offers a glimpse of hope with baseball’s spring training kicking off in a few weeks. It’s also the month to celebrate everything Oscar. The 85th Annual Academy Awards Ceremony will air on Sunday, February 24, and today Turner Classic Movies (TCM) begins its annual event, the 31 Days of Oscar. Now through March 3, they’ll show some of the best Oscar nominated and winning of films from the past 84 years, and for movie fans it doesn’t get any better than that. 1. Casablanca – 1942 – Bogie and Bergman star in this intriguing love story set in World War II era Morocco. Won three Oscars for Best Director, Best Picture and Best Screenplay. February 2 at 8 p.m.
2. Imitation of Life – 1934 – The original film version of the Fannie Hurst tear jerker about the relationship with two women (Claudette Colbert and Louise Beavers) and their daughters. Nominated for three Oscars for Best Director, Best Picture and Best Sound Recording. February 6 at 10:30 p.m.
3. The Snake Pit – 1948 – A horrifying look at a young wife (Olivia de Havilland) who wakes up in an insane asylum and doesn’t remember how she got there. Won one Oscar for Best Sound Recording. February 9 at 4:15 a.m.
4. Peyton Place – 1957 – Soapy fun and racy for its time, this film tells the story of citizens in a small New England town during World War II. Nominated for Best Actor (Arthur Kenney), Best Supporting Actor (Russ Tamblyn), Best Actress (Lana Turner), Best Supporting Actress (Hope Lange and Diane Varsi), Best Director and Best Picture. February 10 at 10:15 a.m.
5. Notorious – 1946 – Cary Grant and Ingrid Bergman take on the Nazis in this Hitchcock classic that is my favorite movie of all time. Nominated for Best Supporting Actor (Claude Rains) and Best Screenplay. February 12 at 10:15 p.m.
6. Gone with the Wind – 1939 – Perhaps the best story ever made of southern life before, during and after the Civil War. Won eight Oscars, including Best Actress (Vivian Leigh), Best Supporting Actress (Hattie McDaniel), Best Art Direction, Best Cinematography, Best Director and Best Picture. February 14 at 8 p.m.
7. Spellbound – 1945 – Another Hitchcock classic about mistaken identity and memory loss featuring Ingrid Bergman and Gregory Peck. Won an Oscar for Best Musical Score. February 14 at 2:30 a.m.
8. Double Indemnity – 1944 – Oddly, Fred MacMurray plays the bad guy in this insurance game thriller. Nominated for Best Actress (Barbara Stanwyck), Best Director (Billy Wilder) and Best Picture. February 21 at 8 p.m.
9. A Place in the Sun – 1951 — Poor boy (Montgomery Clift) falls for rich girl (Elizabeth Taylor) in this intriguing love story. Won six Oscars for Best Cinematography, Best Costume Design, Best Director, Best Film editing, Best Musical Score and Best Screenplay. February 21 at 10 p.m.
10. Wuthering Heights – 1939 – Emily Bronte’s classic tale of unfortunate lovers Cathy and Heathcliff. Won an Oscar for Best Cinematography. February 27 at 10:15 a.m.
February 16, 2012 – I’ve wanted to put together this list for a long time, but it seemed too difficult to wrap my brain around. If you love movies as much as me, you probably understand. How can you pick favorites from the massive variety available without narrowing it down to at least a category? It would be easier to list the ten worst movies ever made. Challenge be damned, I mustered my courage, buckled down and completed the task. P.S. 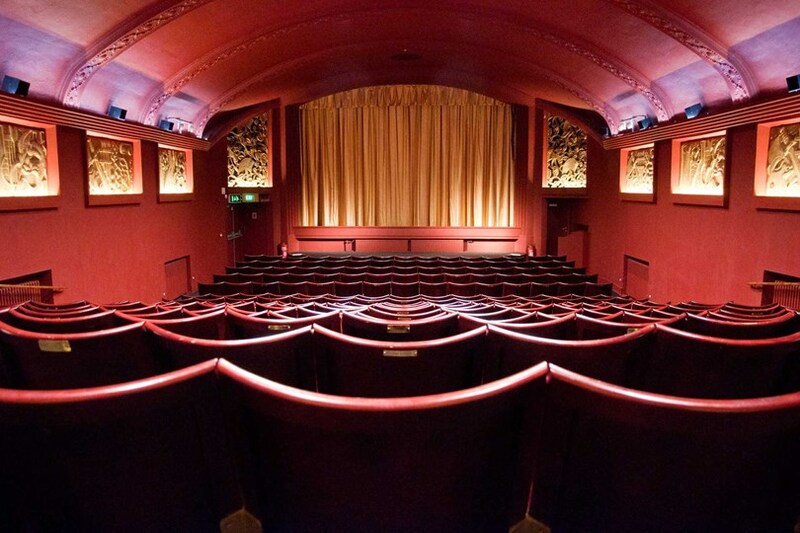 Special mention goes to the following, which made the initial list and had to be cut to narrow it ten, a painfully difficult task: Annie Hall, Amelie, The Big Lebowski, The Graduate, Groundhog Day, A Hard Day’s Night, Terms of Endearment, Thelma and Louise, and The Unbearable Lightness of Being.